Moving house can be a daunting experience, but it can be doubly harder if you are moving to a completely new area. Here are five tips to help you get to grips with a new location. Once you’ve decided to move, your first port of call should be the internet, where a general search should bring you lots of practical information on your new area. Look up the local council’s website for information on services they provide such as refuse collection, local leisure facilities and other council-run services. Similarly, public transport websites will help you work out how to get around. Social media websites such as Facebook and Twitter can be a valuable source of information, not just about the area itself but about events and groups that take place there. A simple search should bring you lots of information about the area and introduce you to potential contacts that could be of help as you settle in. The great thing about social media is that it is instant, so find and follow local news feeds and groups that you are interested in and you will immediately have a constant source of up-to-date local information at your fingertips. If social media is not your thing, they you can go ‘old school’ and look at local noticeboards. These can be found in lots of different places such as the library, GP’s surgery, supermarket or local shop. A local noticeboard is a valuable source of information not only about groups and clubs that run in the area, but they also give you an overall feel for the area and what local priorities are. Everyone likes to share advice and suggestions so make an effort to talk to the people you come into contact with every day such as colleagues and, if you have children, other parents at school or nursery. Local people are your best source of information for specific queries and if they don’t know the answer, you can be sure that they will know someone who does! 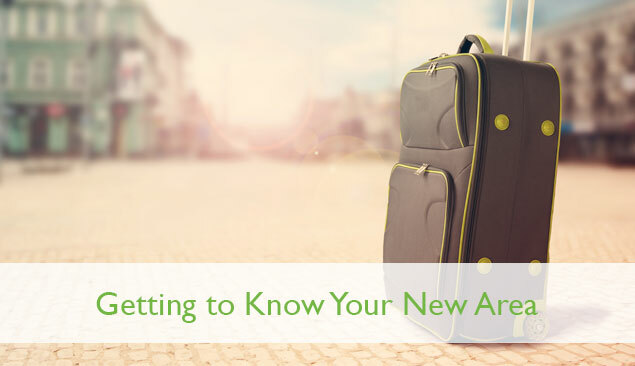 All of the above suggestions will help you learn about your new area but probably the best ways to get to know it is simply to get out and walk around. Ditch the car or the bus for a day and just set off to explore. Use this time to hunt out things that are a priority to you, whether that is the local library, school, park or just the best pub. If you can, it’s really helpful to try and do this at least once before you actually move, so that you at least know where the nearest shop is for a pint of milk!